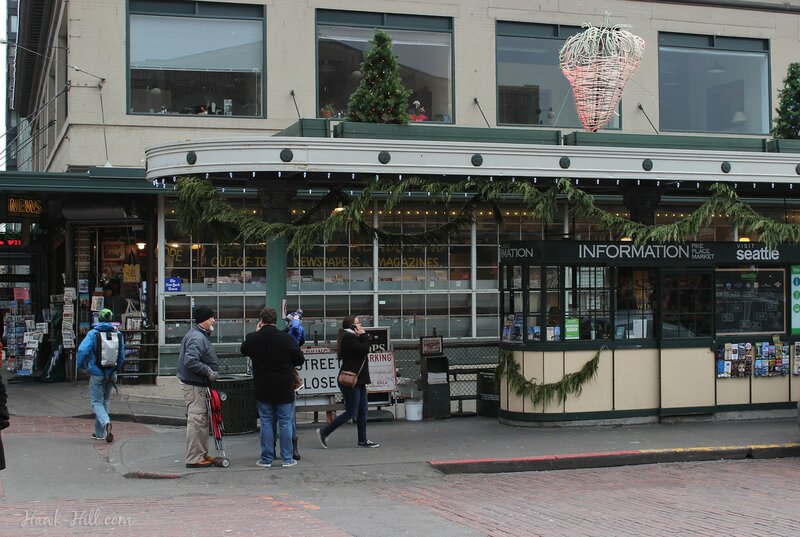 Christmastime is my favorite season at Pike Place Market. 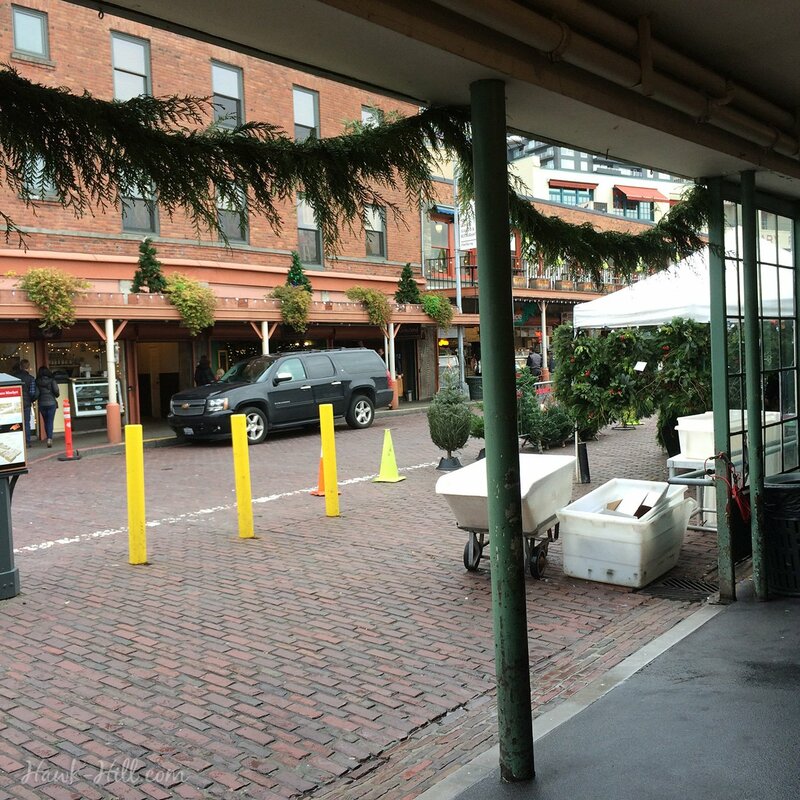 The crow thins out and the market is transformed into a pacific-northwest winter wonderland. Because of Seattle’s temperate climate, December temperatures hover in the 40’s to 50’s.. With cozy winter clothes and warm bakeries to slip inside to warm up, Pike is the perfect climate for a coffee-saturated, delightfully gloomy Seattle December day exploring Christmastime at Pike Place Market. Summer is definitively the peak for Seattle tourism, with weekday calm returning to the market sometime in late September, welcoming me back after my summertime hiatus avoiding the crowds of peak tourist season. 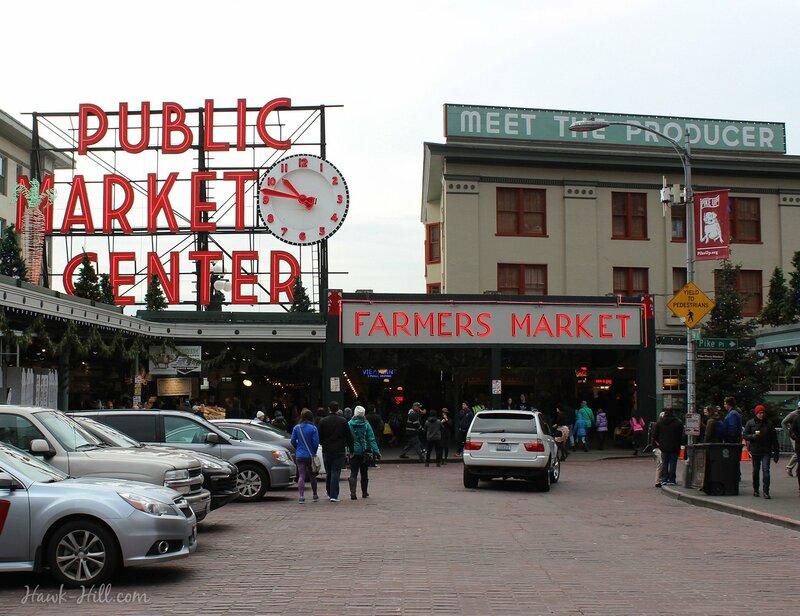 I’ve been taking friends with me to the market lately to hang out and enjoy the atmosphere that’s so much more friendly to locals than the chaos of Pike Place in the summertime. 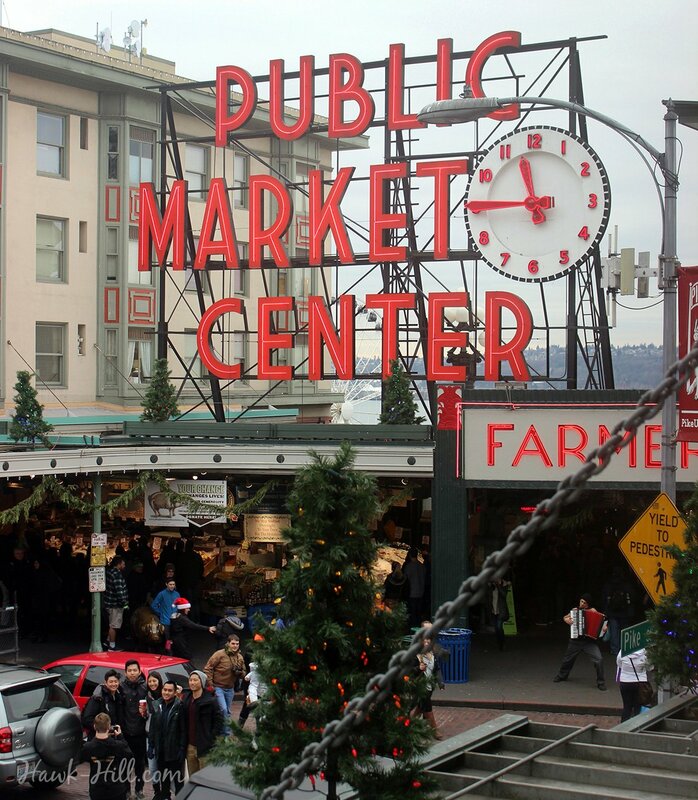 As we’ve been exploring and enjoying all the Christmas Spirit Pike has to offer, I’ve put together this “Christmas Bucket List” specifically for your Christmastime visit to Pike Place Market. • Tents outside the market house the apple and pear vendors, and while cider is a year round offering, the warmth and flavor match perfectly with the Christmas season. • Marketspice, near the fish market, usually has free samples of cider if you’re feeling thrifty. • Grab a seat at a coffee shop across from the Christmas tree vendor and watch as downtown residents purchase adorably pint-sized trees, hauled home over shoulders and slung between friends, for tiny urban dwellings. Just trust me, on the backdrop of cobblestone streets and hipster plaid, this is as good as people watching gets. 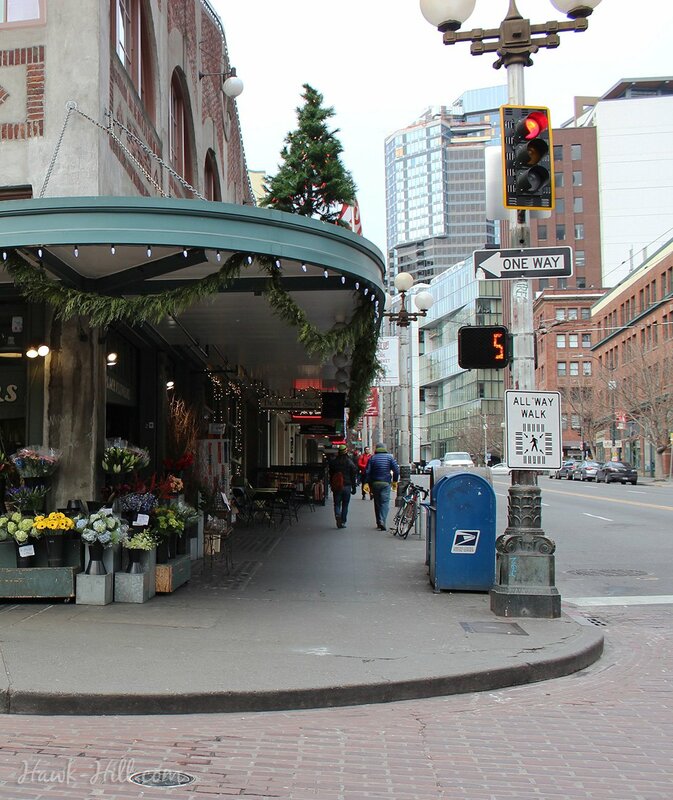 • Pike Place is famous for its flower market. By the time Christmas comes around winter has settled on the flower fields of local growers, but instead of flowers most growers offer arrangements of evergreen, holly, and winterberry for $5-$15. • Pike Place Market Creamery carries hard to find dairy and egg products for Pike’s culinary consumers. On your visit, pop in to discover 5-7 different types of locally produced eggnog. Taste test? • Marketspice has cinnamon sticks in an assortment of varieties and sizes for cooking or for giftwrap decorations. • Friendly staff decant spices from walls of spice jars perched particularly in a diagon ally-esque arrangement. • I love buying small gifts and stocking stuffers here, as the spices are superb quality and they’re willing to sell just a smidge at a time. 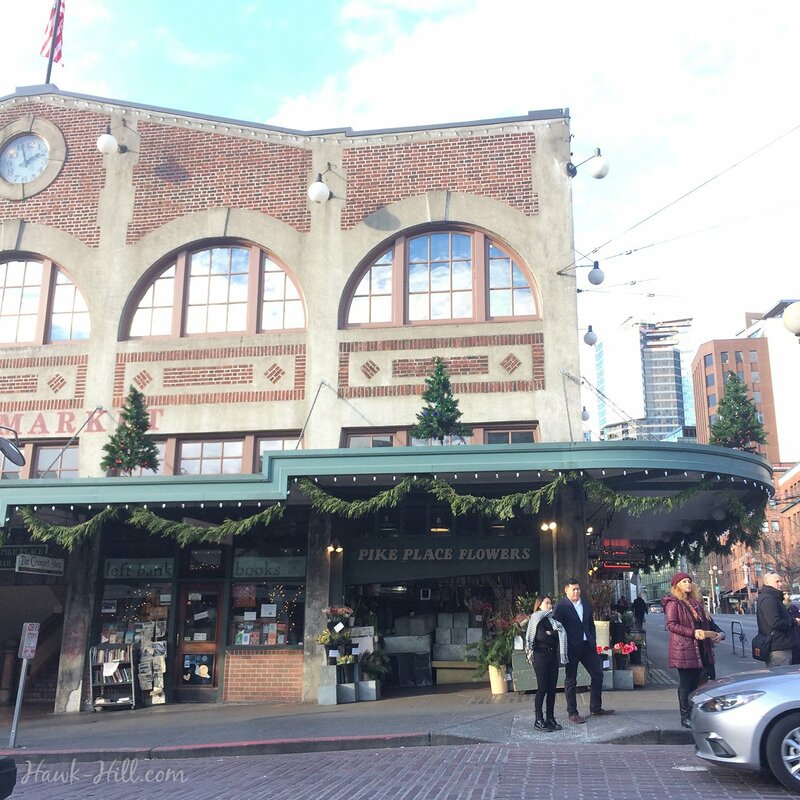 • Pike Place is a great place to do Christmas shopping, as (with the exception of grandfathered-in Starbucks) every shop, stall, and vendor at Pike Place is independently owned and operated. • Buskers, aka Street Performers, are present at Pike Place year round. Hop in for a round of Christmas carols during a December visit. • To get this picture, pose your friends in front of Rachel the bronze pig, then sprint up the stairs in the Sanitary Market (following the signs for Storyville Coffee) and snap this shot from the landing 1.5 floors up. The florist at 1st and Pike, the main entrance to Pike Place, keeps out of season flowers but the cheap and locally grown flowers will be down the hill in the market. 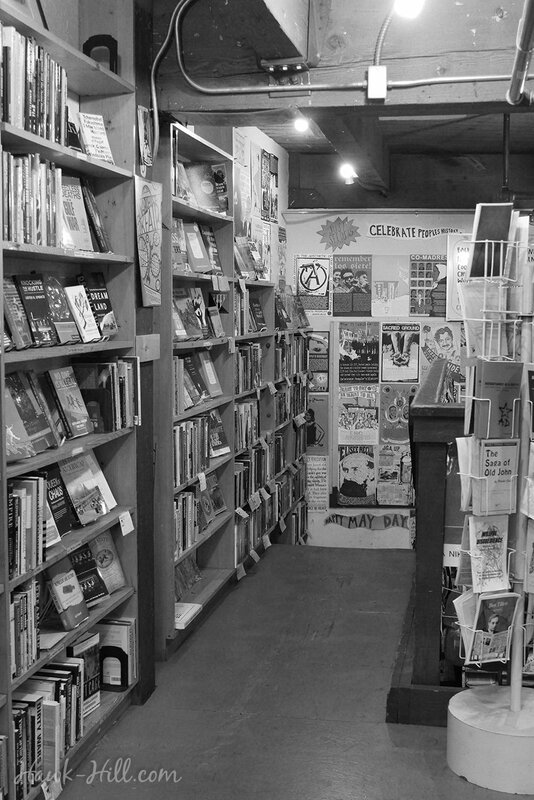 Left Bank Books- where you can pick up a novel, a coloring book, and some anarchist pamphlets! Pike really does have a bit of everything. 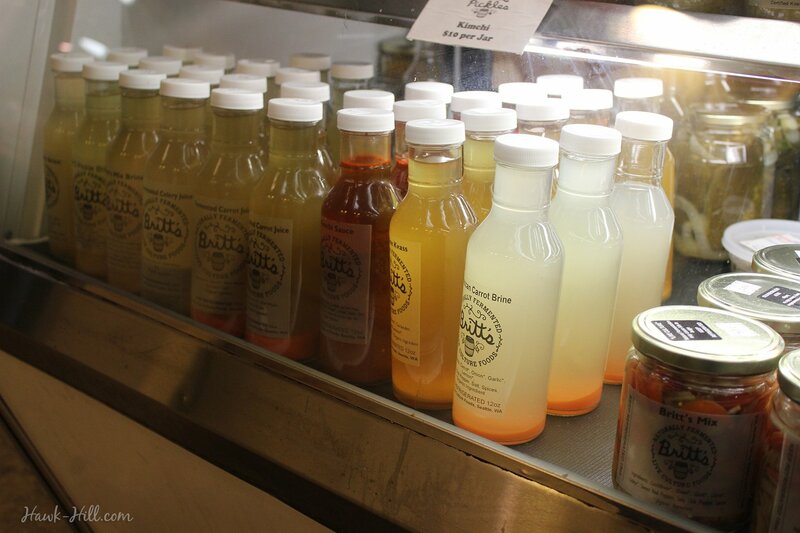 The ombre drink on the right is picket carrot brine from Britt’s Fermented Foods. Gloomy December skies make for great photos in Seattle. The christmas tree lot at Pike Place specializes in pint sized trees for urban dwellers.